I did not get a chance to get out much today. Weather: It was overcast and chilly for most of of the day. I don’t think the temperatures got much above freezing, if at all. A very little bit of snow fell. 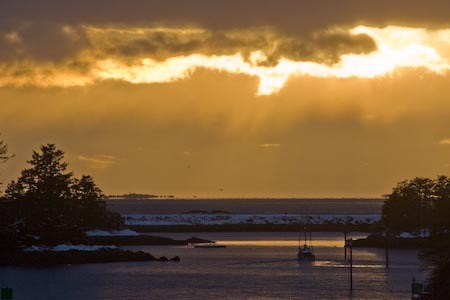 Late this afternoon there was a bit of a break in the clouds over Sitka Sound that allowed for a little bit of color as the sun dropped low in the sky. Other Notes: It’s interesting how a gradual more or less continuous process can seem to have sudden jumps. Today I experienced one of those jumps with daylight. The days are getting longer by about 5 minutes a day now. It is light out before I need to get up in the morning, but that’s not what struck me today. What I really noticed today was how light it was as I walked home from the office around 5pm. Perhaps last week I was coming home a little later as it was getting dark or the clouds were a bit heavier, so the gradual increase in light during the late afternoon was not as noticable to me.